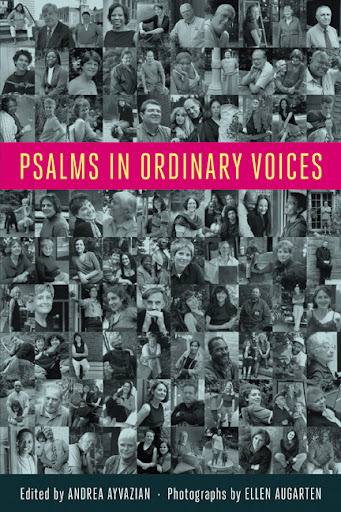 Psalms in Ordinary Voices is an exciting new collection of the Bible's 150 Psalms, each rewritten in contemporary language by an "ordinary" person. The authors are teachers, students, daycare providers, inmates, physicians, janitors, artists, secretaries, pastors, a homeless man, and a sheriff, among others. A portrait of the writer in his or her everyday environment accompanies each Psalm. Together, the words and images reveal the beloved Psalms as both timeless and timely. Down-to-earth and deeply moving, Psalms in Ordinary Voices is filled with images, metaphors, hopes, and visions that build on and refresh the Psalms. A decade in the making, this book was created by The Rev. Dr. Andrea Ayvazian, who conceived the project and edited the text, and photographer Ellen Augarten, whose images give insight into each writer's background.